concrete. It was constructed June 6 1933 and finished in May 29 1935. It was to keep the river from flooding. 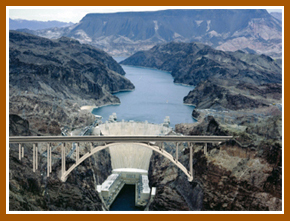 From 1931 and 1947 it was known as the Boulder Dam. The Hoover Dam is 726 feet tall!!! Nevada go to the Hoover Dam!